Go to the CWL Sign Up page. Follow the given prompts and, should you wish to proceed, read and accept the terms and conditions. 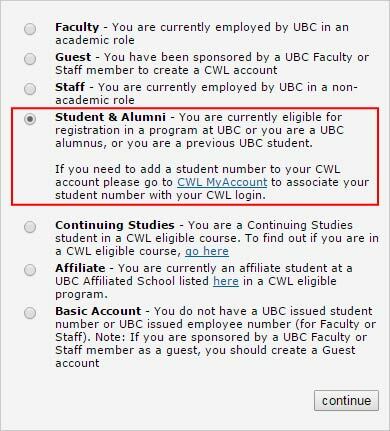 On the second step of the sign up page, select “Student & Alumni”. You will then be prompted to create a new CWL account. You will be asked to choose a username, password and security questions (note: your Student Service Center password is your date of birth in the format YYMMDD). Follow the on-screen instructions to complete the registration process.